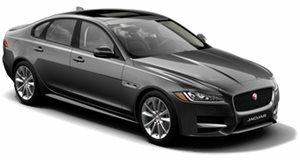 2019 Jaguar XF 30t Prestige RWD powered by 2.0-liter Inline-4 Gas Engine with 8-Speed Automatic transmission. Carpathian Grey Premium Metallic, Special order only. Silicon Silver Premium Metallic, Special order only.